Da Voice whose real names are Ajayi Ebenezer Oluwasegun is a sensational music minister, song writer, multi-instrumentalist and music producer. He has shared stage with A-list artist like Samsong, Joe Praize and Eben to mention a few. Da Voice is also a music director at Christ Embassy. Da Voice who is a soul singer in anticipation for his forthcoming album released a single in December 2016 titled ‘Ayomide’ [My Joy Has Come] which has been a blessing to millions out there since its release. 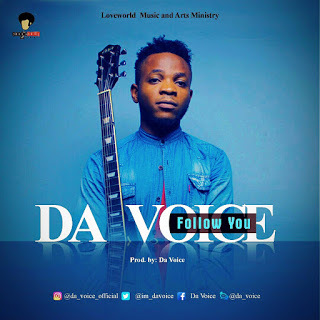 His new single – ‘Follow You’ is a song inspired by the Holy Spirit and re-emphasizes the need for commitment to Kingdom work and soul winning.